Stunning black peep toe ladies shoes with a contrasting fuchsia satin flower by Menbur Avance, Spain. 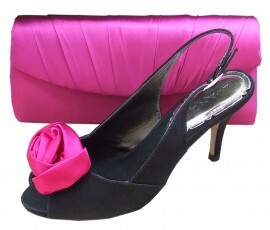 The evening shoes have a 3" satin covered heel with padded insole. A matching clutch bag ia also available seperately. I have just received my first order from "Sole Divas" and I am absolutely delighted. Delivery was prompt and the shoes and bag were exactly as described on the website. I will certainly be ordering again and I have recommended this site to friends and family. Thanks a bundle.